When you want to see gains in productivity, consider a printer upgrade. With this fast and efficient HP CP5225dn LaserJet Pro color laser printer, you will be able to create documents with fast, reliable performance. Connect to your network with the built-in Ethernet port. HP LaserJet Pro color laser printer CP5225dn prints up to 20 pages per minute in black and in color. Up to 600 x 600 optimized dpi resolution for crisp images. 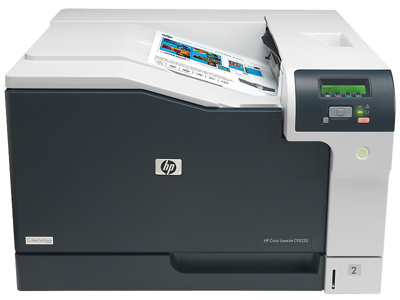 HP CP5225dn LaserJet Pro laser printer features automatic 2-sided printing that saves paper and money. 250-sheet paper tray handles complex print jobs. Also includes a 100-sheet multipurpose tray for envelopes, letterhead and more. First page is out in as few as 16 seconds with this HP LaserJet Pro color laser printer. HP Auto-Off technology helps save energy. Features built-in 192MB of memory for improved print speeds. Expandable up to 448 MB. Gain control of your printed documents and make an impact when communicating. One versatile printer covers all your printing needs from general office to oversize documents. This printer wakes up fast and prints your first page as quickly as 16 seconds. JRRYAN: Printer works fine. I have 3 -4 hours into trying to get it to work on a machine running Windows Vista Ultimate Service Pack 2 64 Bit. Unable to get it to print Setup as a network printer. Network install works fine on machine with Windows Vista business 32 bit using supplied disk and Windows 8.1 Pro 64 bit using the Universal Printer Print Driver.